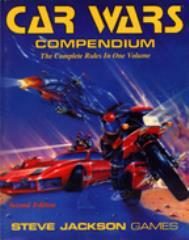 Now, all your Car War rules can be found in one book - The Car Wars Compendium. Included are the rules from Car Wars Deluxe Edition, Boat Wars, Dueltrack, and the Uncle Albert's Catalogs through 2039 - as well as clarifications, improvements, and new rules from the pages of Autoduel Quarterly, streamlined for faster play. Design your own cars, cycles, trikes, vans, trucks, 18-wheel tractor-trailer rigs, boats, helicopters and hovercraft! The Car Wars Compendium is organized and indexed for easy reference, and includes 8 extra pages of charts and tables!